“No dream is too big, no dreamer too small” in this charming tale of a little mouse whose one wish is to perform on Broadway. I was immediately enchanted with this book by just the Introduction. “Here’s the Scoop” makes you keenly aware that you are dealing with a theatre lover (NOT theater because theatre is “just correct”.) The first-person, effusive description of the theatre itself, the people who work in the theatre, and “(sigh) applause”, spoke to the girl in me who had dreams of performing on the Great White Way. It doesn’t even matter that the narrator is a mouse, if you are a theatre kid at heart, you know her. I even forgot she’s a mouse at times because of her very human mannerisms. Description of her brothers (the Hooligans) and her dad’s job (she does not know what he does nor does she care), her relationship with her seamstress mom, her interactions with the many people at the theater, all highlight the fact she is just an average player in this life. Besides the tone of her writing, you know she’s talking to a child reader because she acknowledges it. Even though this is a first-person narrative, rarely does the reader get directly addressed in such a way where the speaker knows who their audience is. “… please keep reading because some grown-up already bought the book for you, and they (and I) will be heartbroken if you don’t finish it.” This gives it a lovely personal touch that will draw a young reader more into the story. This book is a backstage pass to the workings of a Broadway show. We are given entertaining snippets of the life and duties of ALL the people who work to get a Broadway show up and running. From the seamstress to the star of the show, everyone gets a nod because EVERYONE is integral to its success. It’s more than that, though. 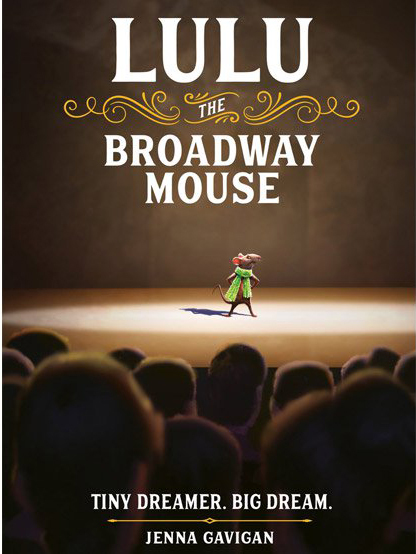 “Lulu the Broadway Mouse” is a love letter to theatre. It recognizes its glory and heartache. It breaks it down that only a precious few ever get to live out their dream of performing in a Broadway show. It takes heart, talent, and luck. While many of the show references will go over the heads of the intended audience, I think it is a clever way to get children who are reading the book to go searching for the shows Lulu refers to. What better way to bring classic shows to a new generation? I’m sure the author’s hope is to send some of her readers to seek out videos and cast recordings of the shows mentioned so they too can fall in love with them, just like Lulu did. This novel’s release date is October 9, 2018 and can be purchased at Amazon.